The development of innovative technologies has encouraged the growth of the internet protocol based cameras which is expected boost the School and Campus Security Market over the future. The global school and campus security market was dominated by few players. However, due to rapid increase in the number of crimes and the increasing demand for security in schools and universities are boosting the overall growth of the market. The market is growing in the North-American region as it holds the largest share for access control majorly due to digitization and interconnected environment. Therefore, the demand for access control is expected to boost the school and campus security market. 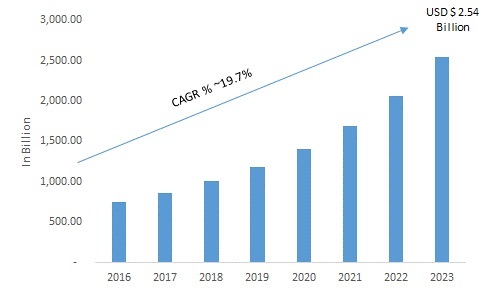 Also, the card based authentication and biometric solutions are expected to dominate the market over the forecast period, 2017-2023. The global school and campus security market is expected to grow significantly over the forecast period, 2017-2023. Access control segment of school and campus security market globally drives the market majorly due to increasing demand for safety measures from countries such as China and India. The market is expected to have higher growth rate as compared to the previous years. Asia-Pacific region expected to grow at a fast pace over the forecast period, 2017-2023 majorly due to high implementation of new technologies, large number of market players, growing security concerns and government initiatives to protect terrorism and criminal activities are the factors contributing to the growth of the market. Countries such as China, India are implementing various security solutions such card authentication, biometric to track the number of students with in the premises. According to Market Research Future, market has been segmented into hardware, software and region. Out of these software, video analytics accounted for the largest market share majorly due to high demand for effective video surveillance, government investments in emerging technologies to enhance security. Out of these type, access control accounted for the largest market share majorly due to increasing urban infrastructure and increasing security threats across the world.